There is a timeless observation made by the great fashion designer, Coco Chanel. It illustrates the importance of accessorizing (in fashion, home & life) and it illustrates the importance of accessories. She is said to have observed that when a woman is fully dressed, including accessories, that she should edit out one item before leaving home. How very wise! Accessories, specifically for the home are a challenge for many. Coming from a “more is more” aesthetic, I struggle with editing as much as anyone. Proceed with caution, but never with fear. I have seen too many homes where the accessories are overdone. The truth is, they are too easy. There are too many in quantities so great they are hard to pass up or ignore. On the opposite end of the spectrum too few accessories can underwhelm to the point of distraction. Then, trying to factor in issues of color, scale and proportion and it is easy to throw your hands up and surrender. I want to share with you my approach about accessories when I start sourcing for clients that can ensure your own success. Start with your own treasures. Gather up all of those things that have meaning. Then go through your closets and cabinets for those treasures that might have been lost or forgotten. Layering is both a technique and an approach. 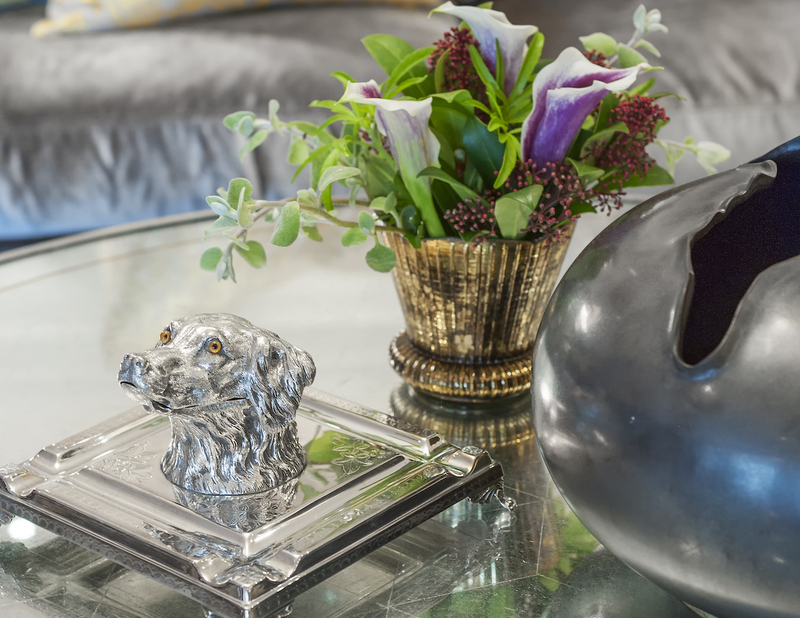 Your tabletops and surfaces become more vibrant when layered with beautiful objects and mementos. Every surface becomes a stage to tell a story. I love to say, “it’s all in the mix”.Combine the fine with the casual, the high with the low and the soft with hard. Allow the eye to move left to right and up and down. Create space between objects to allow the eye to stop and admire. Art can be even more exciting when you mix both traditional and modern art, as well as, traditional and modern framing styles. It is the mix and the contrast that enlivens each in your home. Family-photo walls. I have rarely done a home without one! They work almost anywhere and create an instant sense of home and tradition. Dining rooms and powder rooms, however, I keep free of family photos. Sometimes it’s just as important to know when to say, no. Accessorizing is a form of storytelling. What you will find is you do not have to yell to get your point across. The Investment. When it comes to your accessories and art, price is not the indicator of value. Buy what you love and what you can afford. Some of my favorite pieces to display are kids’ drawings in elaborate frames. The Love. Love what you buy, love what you choose to live with. Art and accessories are like the jewelry of a well-dressed room. It can make the most humble of choices a masterpiece. Presentation is everything! Mix Mediums. When creating your collection or displaying one, mix a variety of mediums. Combined framed pen & ink drawings, sketches, oils, acrylics, photography and sculpture. Design can be transformative, therapeutic and empowering! It’s not about stuff, it’s about your choices. Who are you? Tell your story. Be kind to yourself, you cannot get this wrong. Based in Palm Springs, The Standard presents diverse content that reflects the LGBTQ lifestyle and culture, including arts and entertainment, health, fashion, news and views, and inspiring features.